– Vivian P.Welcome to Microsoft Excel – Getting Started With The Basics, where you can learn how to get the most out of Excel, even if you are a complete beginner! You will learn all about Excel cells, Excel rows & columns, how to speed up your work with Excel sheets and easiest ways of sorting & filtering data in Excel. 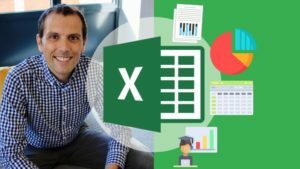 We will explore some of the most popular Excel charts and Excel functions and from there we will dive into best practices to make sure you know how to effectively use Microsoft Excel. As your instructor, I will use my experience of Excel training in some of the biggest UK companies to guide you step by step on your way of mastering the basics of Microsoft Excel. Whether you’re looking to do your job faster, wow your boss, step up your data analysis game using Microsoft Excel or to improve your resume, you are in the right place.